Young Garrett Eckbo out for a joyride. 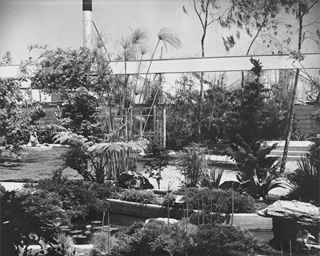 Eckbo's Nishi Garden, Los Angeles, 1952. Much more than Tommy Church, who moved in High Society as though he belonged, Garrett Eckbo (1910-2000), who grew up in poverty and didn’t hide his distaste for capitalism, represents the socially conscious side of landscape design. Like many landscape architects, Eckbo, who later studied at Harvard, began with small residential gardens, designing and helping install hundreds in the Pomona Valley. 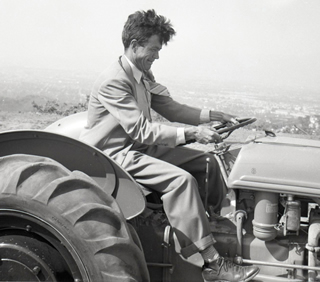 Soon he was helping design communities for migrant farm workers. “This was an opportunity to design and build exemplary modern community social/spatial structures for the lowest economic levels. They were not corrupted by the pressures for social distinction and profitability that tended to destroy the larger environment,” he wrote. Eckbo, who spent much of his career in Southern California, is known for dividing gardens into zones of activity marked by plantings or by different materials, and for spatially dynamic compositions integrating curved borders, lawns and waterways with rectangular forms and diagonal lines. Many of Eckbo’s gardens are designed around a “characteristic open center,” where the people who use the garden serve as the centerpiece rather than plants or structures, wrote Reuben Rainey, a professor of landscape architecture. Eckbo’s work is influenced by Asian design. “The history of design in China and Japan equals that of the West but is infinitely more subtle and flexible in form and space, less rigid in interaction with nature and richer in its content of people/nature relations,” he wrote. His larger work included the California Open Space Study in the 1960s, a survey of all land within an hour’s drive of the state’s large cities. He recommended that half the land be preserved as open space, a suggestion that was not adopted.